The Macleay catchment is on the New South Wales (NSW) mid-north coast. The catchment of 11,450 square kilometres includes extensive areas of the northern tablelands, a sparsely populated escarpment area and a coastal area ranging from foothills to coastal plains. From the gently rolling hills of the tablelands, the central catchment is mountainous with deep gorges. The lower catchment comprises wide floodplains extending to the coast and includes Kempsey and South West Rocks. Armidale, Walcha, Guyra and Kempsey. The Macleay is a major river on the NSW north coast. It rises in the Northern Tablelands and flows south-east through a coastal floodplain to South West Rocks, where it meets the Pacific Ocean. Important tributaries include the Apsley, Chandler, Styx, Tia, Dyke and Yarrowitch rivers, and the Commissioners Waters. These tributaries pass through a number of spectacular gorges and waterfalls in the Oxley Wild Rivers National Park. View real-time data from the Macleay catchment on this website. Land and water users in the catchment include local councils, water utilities, conservation, livestock grazing including dairying, dryland agriculture, some forestry and tourism. 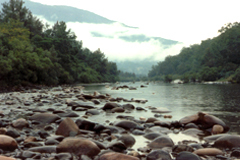 Most of the rivers and creeks in the Macleay River basin are unregulated, without major storages to capture and control flows. Most water users rely on natural flows or small structures, such as weirs for their water supplies. As with many unregulated rivers, flows are most affected during relatively dry times, when water is low and demand high. Macleay Estuary is a significant ecosystem for a range of aquatic and terrestrial flora and fauna. Natural resource issues range from New England Dieback, dryland salinity and soil degradation to acid sulphate soils, streambank erosion and fish habitat destruction. Much of the tablelands has been cleared of trees and is now covered in native and introduced pastures. Rainforest and wet sclerophyll forests occur in the steep slopes and gorges of the escarpment. The lower ridges support wet and dry sclerophyll forests. These give way to cleared pasture land and wetlands on the floodplain. Coastal vegetation comprises grasses, shrubs and trees on the dunal system.